The night I made Pasta with Pesto, I developed a backup plan to make risotto with pesto. And since I'd put so much thought into it, I decided to try it out too. Why a backup plan? That afternoon, I'd asked Chris to pick up the pasta from the store on his way home. When he arrived--clearly grateful to be home--I didn't see a grocery bag. Rather than ask about it, and risk sending him back out to get it, I decided instead that I could make risotto with pesto, which would be just as satisfying as pasta. As it was, the grocery bag was in his backpack, but I still though risotto with pesto could be interesting. Rice and pesto by itself begged for something else as a highlight. Isa Chandra of Post Punk Kitchen has this recipe for risotto with roasted zucchini, which I thought could be interesting. She roasted her zucchini for 12 minutes, but I did mine for a lot longer, about 25-30. Might just be my oven, but I wanted it a little brown, and it was nowhere near that at 12 minutes. This dish was great, but I think it could be even better with some additional flavors, such as bacon and toasted walnuts. 2. In a large dutch oven or deep-sided sauté pan, heat butter and 1 tbsp. olive oil over medium heat. Add onion and sauté until softened, about 10 minutes. Stir in the rice and continuing cooking to lightly toast rice, about 5 minutes. 3. Add the wine and cook, stirring frequently, until it is absorbed (the bottom of the pan will be dry when the rice is pulled away with a spoon). Add 2 cups of corn broth to rice and cook, stirring frequently, until the broth is absorbed. Continue adding broth, about 1/2 cup at a time, waiting to add additional broth until each addition is fully absorbed. After about 2 cups more have been added (4 cups total). Taste rice--dish is done when the rice has the consistently of al dente pasta, which you may achieve before all 4 cups of broth are added (last time I made it, it took 3 1/2 cups). Do not overcook. Stir in pesto. 4. 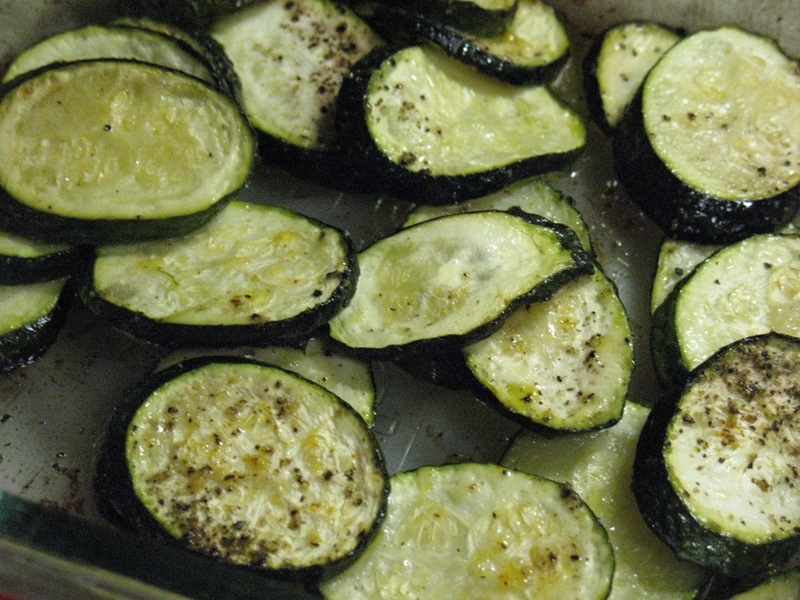 Once oven is hot, while risotto is cooking, roast zucchini: In a 9 x 9 baking dish, toss zucchini with 1 tbsp. olive oil and season with salt and pepper. Roast until tender and lightly browned, about 25-30 minutes. 5. Serve risotto in bowls topped with roasted zucchini. 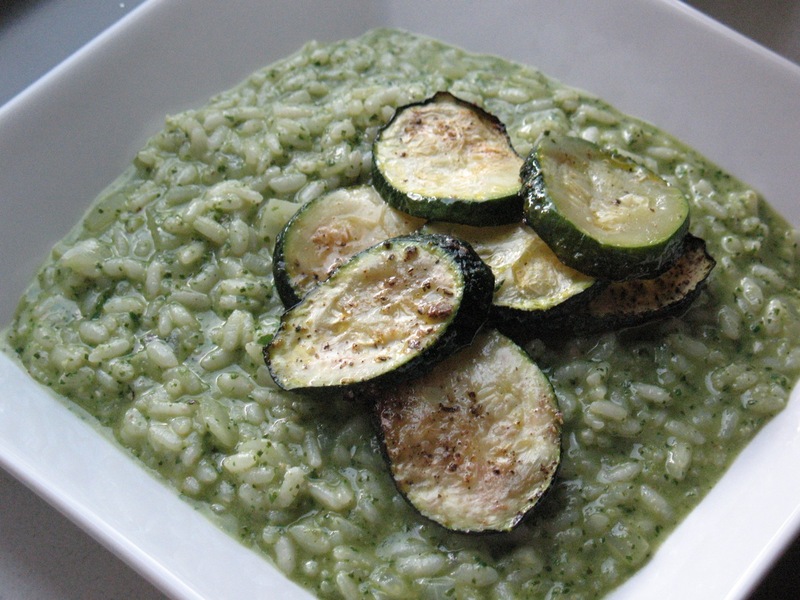 As much as I like risotto, I remember the star of this dish being the roasted zucchini. I agree bacon could work well here. Also: Sorry you didn't see my grocery bag!